Mobile photography from the hip. The serious iPhone photographer has forsaken their DSLR and the weight of a bag full of gear. But they’re running out of pockets. That’s because mobile photographers, much like a DSLR shooter, are starting to carry some of the same accessories: lens attachments, filters, a battery, jump drive, and a tripod. Carrying a bag feels like a cumbersome step backward. A Phoneslinger could keep you quick on the draw. 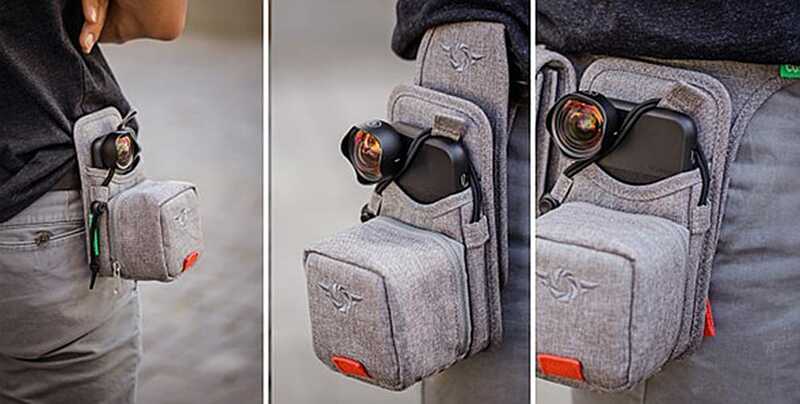 Once you stop chuckling at the product name, consider the functionality of a gunslinger’s holster and how it might be a practical solution for the mobile photographer. 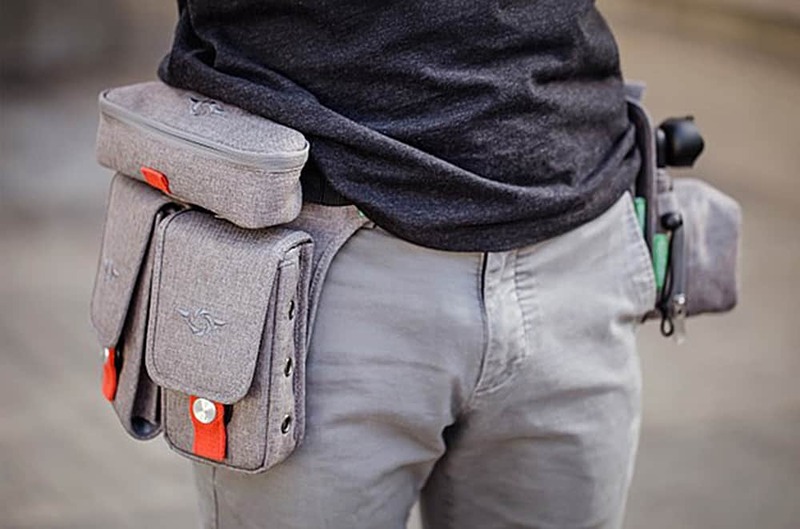 Phoneslinger, designed by the German company Cozyspeed, is a system of small bags that fit on a belt constructed to carry a range of accessories. The iPhone has become the primary camera for many users simply because it’s a quality camera that fits in the pocket. But creative filmmakers and mobile photographers push the limits of the smartphone by carrying extra gear. Some of the lens attachments, like those from industry leader Moment, are chunks of quality glass that aren’t heavy but aren’t exactly best stowed in a pocket. The Phoneslinger Prime holds the phone plus as many as four lenses. Phoneslinger, now available for pre-order on Indiegogo, lets the user customize their carry. Cozyspeed even makes a compact wireless battery for charging in the field. There are belt pouches of various sizes but a good place to start is Phoneslinger Prime currently at $49. It securely holsters the phone but is outfitted with a front compartment that can hold as many as four lenses. Phoneslinger Power, $79, comes with an 8000 mAh QI-Wireless battery that will work with iPhone X and the Galaxy Note. It has a compartment for the phone as well as a pocket for flat items like cash or credit cards. The Prime Kit comes with both bags attached to a belt. There is also a pouch that is ideal for a table-top tripod. There are various other-sized pouches to fit the modular belt system. Phoneslinger was built out of an earlier product, the Camslinger, a larger belt bag made to fit mirrorless and other compact cameras. Cozyspeed will ship Phoneslingers by March if the company can hit its crowdfunding goal and go through production hitch-free.